4 Days Bhutan travel tours through the mystical Western valleys of Bhutan is an ideal introduction to the Dragon Kingdom. 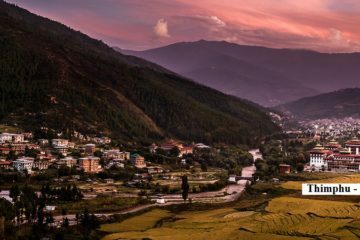 Experience Bhutanese hospitality, admire the ever-changing landscapes, and immerse yourself in Bhutan’s rich Buddhist culture. 4 Days Bhutan travel tours highlights include Ta Dzong Museum, Rimpong Dzong with its wooden cantilevered bridge and the infamous Taktsang Monastery (Tiger’s Nest) in the beautiful Paro Valley, The National Memorial Chorten, 12th century Changangkha Temple and the National Library exhibiting ancient scriptures in Bhutan’s capital Thimphu. View 4 Days Bhutan travel tours in Google Map. Bhutan Tourist Tariff Royalty & Visa fees All private excursions and transfers. Today we will be exploring more places visiting Handmade Paper Factory, Folk Heritage Museum, Memorial Chorten and Changangkha Lhakhang. Later evening we will drive to Paro. Evening, you can explore some handicrafts shops nearby town. Our tour was well organized and had a great time. Thank you, Karma (Guide), who made our trip to Bhutan a wonderful experience.